Where cozy lattes, all the squashes, and cinnamon-flavored-everythings take over full reign of my plate. There is no denying the draw of autumn's culinary treats. Even my kitten gets leftover pureed pumpkin with his meals lately. He sure is warming up to his first fall, and we are loving all the extra cuddles. During pumpkin spice season, you can pretty much guarantee I'm going to infuse these rich and spicy flavors into a recipe appropriate for every meal, just so I can indulge anytime of day, without sacrificing nutritional quality. When I came up with the idea to make a pumpkin spice chia pudding, I had no idea it would turn into THIS masterpiece. I have to say, I definitely saved the best for last, now that October is nearing it's end. Every year I somehow inevitably hit a sort of 'pumpkin-overload' (gasp! ), where there's no turning back and only moving forward until the following year's October, BUT I haven't hit that yet this year, so for now I'll continue whipping up this insanely delicious layered treat in a large enough batch to share and savor through Thanksgiving. This recipe is a 2-fer!!! 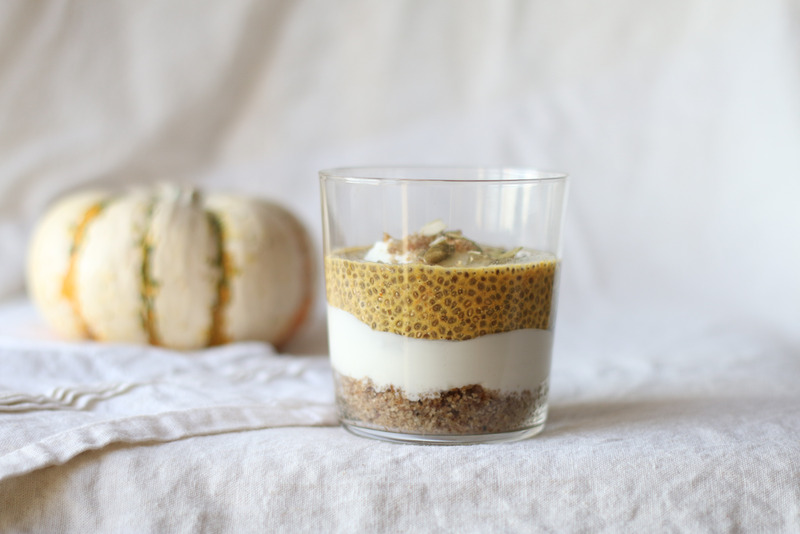 Not only do you get to make pumpkin pie chia pudding parfaits, but you also get instructions for creating your own homemade pumpkin spice creamer! I have been adding this decadent mixture to my pumpkin-spice coffee all month, and it really steps it up a notch (or 10). To enjoy this recipe simply as the creamer, combine all ingredients except for chia seeds into a jar, cover with a tightly fitting lid, and shake well. Store in the refrigerator for up to 5 days. To make the chia pudding, whisk all ingredients except for chia seeds together in a medium mixing bowl until thoroughly combined. Stir in the chia seeds, and continue to whisk for 3 minutes to allow the chia seeds to gelatinize (otherwise they collect at the bottom into a giant clump). Cover with a lid, and set in the refrigerator overnight to thicken. Place all crust ingredients into a small food processor, and pulse until a fine crumb mixture remains. It should look like loose granules that press together easily when pinched between your fingers. Press 2-3 Tbs. of crust into the bottom of a bowl or glass cup. Next, spread on a thick layer of your favorite unsweetened yogurt. Garnish with an extra dollop of yogurt, a sprinkle of crust crumbles, and a few crushed pepitas. I recommend using a homemade creamy almond milk, oat milk, or other mild-flavored milk (not too watered down, keep it a little on the rich side!). My favorite brands for store-bought include: Good Karma flax milk (1200g omega-3's + optional protein), Ripple Foods pea protein milk (8g protein per cup! ), and Oatly oat milk. Feel free to get creative here! If you want to add a sprinkle of dried ginger, a dusting of freshly grated nutmeg, go for it! Maca might also be nice in this mixture, so play around if you're the experimenting type! There are so many wonderful things to say about the ingredients in this recipe. I'll try to keep it brief, but I want to make sure to share how exciting it is that something this indulgent can also be so health-promoting! Walnuts - Walnuts contain melatonin, which helps to regulate the nervous system and acts as an anti-cancer nutrient, and they also have an incredibly high amount of omega-3 fatty acids, which reduce inflammation in the body and contribute to brain health. Pumpkin seeds - Pumpkin seeds are especially rich in Manganese, which plays an important role in bone health, collagen production (hellooo, youthful skin), and protects cells and tissues from oxidative damage such as stress, . Cinnamon - Adding cinnamon to high carb foods slows the absorption of sugar into the bloodstream, slowing the body's insulin reaction. A frequent high spike in insulin as caused by eating sugar-rich foods too often is what contributes to metabolic disorders and inflammation. Therefore, sprinkling a generous amount of cinnamon on may be a way to keep things under control when you decide to indulge! Chia seeds - Chia seeds also work to stabilize blood sugar, and keep you feeling fuller, longer. Plus they contribute a rich source of omega-3 fatty acids, which work to lower total and LDL cholesterol. Stay happy, stay healthy, my friends!